A Louisiana student’s fitness level has an impact on his or her academic performance, according to a report released by the Picard Center for Child Development and Lifelong Learning at the University of Louisiana at Lafayette. The report also revealed that more than half of participating students in Louisiana are considered unhealthy, with almost one in three students classified as obese. State and national data reveal that childhood obesity began its climb in the early 1980s. “This increase has been going on for three decades and can be attributed to a multitude of factors, such as a decrease in physical activity and the consumption of healthy foods, and well as an increase in television and other media usage,” notes Picard Center Executive Director Dr. Billy R. Stokes. The report’s findings are a result of a 2009 La. legislative mandate (Act 256) that encourages school districts to participate in statewide student physical fitness assessments, in which more than 25,000 schoolchildren in 15 school districts participated. The participating districts included: Caddo, DeSoto, Jefferson, Lafayette, Lincoln, Morehouse, Natchitoches, Ouachita, Red River, Sabine, St. Mary, St, Charles, St, Martin, West Baton Rouge, and West Feliciana. The study is a first of its kind in Louisiana, as it went a step further to examine whether the health of Louisiana’s students also impacted other areas of their lives, such as their behavior in school and academic performance. • More than half, or 53%, of students had an unhealthy BMI (either underweight, overweight or obese), with almost one-third (31%) of students classified as obese. • La. students performed poorly on fitness tests measuring muscular strength (push-ups and curl-ups) and aerobic capacity (PACER). In fact, only 39% of students met minimum aerobic fitness levels. • Only 9% of students passed all five fitness subtests, while 37% passed less than half of the subtests. That is – more than one-third of the state’s students did not meet minimum fitness standards on most of the fitness assessment subtests. • Students with no behavior incidences (an office discipline referral that results in a suspension or expulsion) had slightly higher overall fitness scores than students with one or more behavior incidences. However, the difference was not statistically significant, and the Picard Center will continue to investigate the relationship between fitness and behavior. • Researchers found a statistically strong relationship between overall fitness and academic performance on the LEAP English Language Arts and Math tests. o	In general, the more fitness subtests a student passed, the higher he or she tended to score on the LEAP assessment. • Students who passed all of the fitness subtests were most likely to score in the Advanced or Mastery levels of the LEAP test. • Students who passed none of the fitness subtests most likely scored Unsatisfactory on the LEAP test. • Consult with nationally recognized experts on addressing childhood obesity interventions. • Utilize the study’s data on student fitness to create an ongoing dialogue about children’s health among children, families, schools, nonprofit organizations, government agencies and legislators. “ The interventions or ‘fixes’ for this epidemic should not rest solely on the backs of the school systems. Children are only in school 20% of their time throughout the year and eat one-third of their meals there. That being said, however, school systems should play a leadership role in helping parents and communities develop customized solutions,” said Stokes. The Picard Center’s future research plans include adding 10 additional districts to next year’s statewide student health study, purchasing fitness assessment software for up to 30 school districts this school year and eventually gathering fitness data on all 659,000 schoolchildren in Louisiana. As part of its release of these findings, the Picard Center coordinated events around the state to support local student health initiatives. Further, in coordination with the first-ever National Childhood Obesity Awareness Month in September, Gov. Bobby Jindal has officially declared Wednesday, Sept. 1 as “Student Health Day” in Louisiana. University executives, state agency heads and government officials joined the Center’s researchers in observing this day by learning about the state of La.’s student health and action steps to address this epidemic. They also signed a pledge to lead a healthy life. Schoolchildren around the state, including West Feliciana, Natchitoches, St. Martin, DeSoto and St. Mary parishes, signed a pledge to lead healthier lives by taking simple steps toward a healthier mind and body. Other activities around the state for Student Health Day included an initial School Health Advisory Council meeting in Jefferson parish, the introduction of innovative physical education in Morehouse parish, Healthy Lifestyle Choices health education curriculum kick-off in St. Landry parish and the beginning of physical fitness testing in Monroe City schools. Additionally, some districts are conducting health related events on separate days including Sabine and Pointe Coupee parishes. Assisting with the planning and running of these events were the Picard Center’s university partners including UL-Lafayette’s College of Nursing and Department of Kinesiology. Other universities involved were the University of Louisiana at Monroe, Louisiana State University at Baton Rouge and Northwestern State University. The Cecil J. Picard Center for Child Development and Lifelong Learning is a research center comprised of a multidisciplinary group of evaluation and research professionals who focus on early childhood, K-12 education, school-based health, poverty’s effects on families, and lifelong learning. 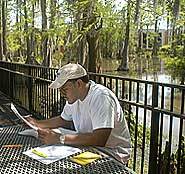 As an integral part of the University of Louisiana at Lafayette’s research mission, the Center provides high-quality, rigorous evaluations of programs that are implemented to address learning from birth through adulthood. Applied research is continually conducted in all areas of education, health, and well-being to ensure a prosperous and healthy future for all of Louisiana's children.